An SPG variant on the basis of the А45 Conqueror. It was planned to mount either a 105-mm, 140-mm, or 152-mm howitzer in a closed armored cabin. The vehicle existed only in blueprints. 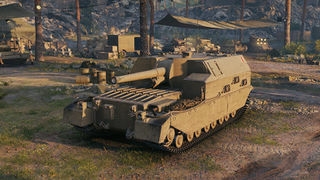 While not considerably the most nimble of the Tier VIII SPGs, unlike its predecessors, the FV207 adopts a more heavier artillery fashion; Keeping up the pace with its noticeably faster reload speed and smiting any stationary or slow moving targets with deadly grace. Top gun's fast reload, accuracy, and aim time makes up for its lack of damage. The FV207 is a hit and miss for most people. Right of the bat the first thing everyone notice is the weak alpha damage for its top gun compared to the SPG's in the same tier. However, thanks to it's wide gun arc and fast reload speed it's much easier to hit moving targets with this artillery than with any other in its tier. Also, if you hit weakspots in the enemy tanks, the FV207 can be very deadly. Unfortunately, unlike most British artillery, this one doesn't have good mobility. Couple this with it's big size, and it makes changing positions very difficult, although it's closed armor makes it more resilient to counter battery fire. Nothing carries over from the Crusader 5.5-in. SP, but the WS No. 22 Radio carries over from the FV304. Mount it immediately. The Rolls-Royce Meteor Mk. IVC Engine can be mounted without upgrading the suspension. If you would prefer to increase your firepower over your manoeuvrability, instead research the FV207 Suspension, followed by the Q.F. 6-in. Gun Mk. V, then research the engine. Finally, research the SR C42 Radio. 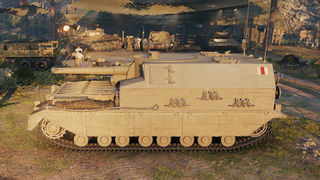 Shortly after development began on the A41 Heavy Cruiser aka Centurion, the British drew up a specification for what was known as the ‘Universal’ Tank which was to be one basic hull design being adapted to suit a variety of roles in a complete series of vehicles, from heavy tanks, through self propelled guns all the way to APC's. Initial chassis was borrowed from the A45 Infantry Support tank whose development started shortly after that of the A41 Centurion tank. The first prototype was the FV201, and turned out to be the most popular proposal from FV200 series. This vehicle was running in 1948 but development costs were rising and by 1949 it had been found that the Centurion had developed into an extremely versatile vehicle capable of providing most of the Universal tank variants. As a consequence the Centurion became the universal tank and development on the FV200 series was cancelled with the exception of the FV214 which was required to counter the threat posed by the Soviet IS-3. This vehicle was subsequently named 'Conqueror'. To match the firepower of the IS-3 the Conqueror was fitted with an American 120mm gun the ammunition of which came as a separate charge and projectile. This was the first time such ammunition had been used in a british tank, unfortunately the charge came in a large brass case and took up much valuable space. The turret had a better ballistic shape than the Centurion and featured a contra-rotating commanders cupola which was located in its own compartment at the rear of the turret and effectively prevented the commander from seeing what was going on in the main turret. The commander had a cross-cupola rangefinder allowing him to select new targets whilst the gunner was observing elsewhere. The commander could then remotely traverse the turret to whatever his cupola was being used to observe. 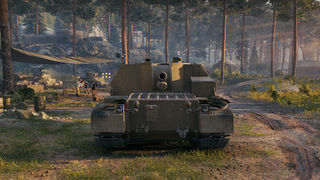 Despite the size and weight, Conqueror turned out to be more mobile than Centurion across rough ground due to low ground pressure from the very wide tracks, and massive power available from the fuel injected Meteor engine. In all 185 Conquerors were delivered to the British Army and remained in service from 1955 to 1966. They served in Germany with a maximum of nine allocated per regiment being used as long range support for Centurions. Vickers also produced eight FV219 ARV Mk Is and 20 FV222 ARV MKIIs. This page was last modified on 31 August 2017, at 23:49.